Background: Major League Baseball (MLB) players are throwing the ball faster and hitting harder than ever before. Although some safety measures have been implemented, by decreasing the 15 days on the disabled list (DL) to the 7 days on the DL, concussion rates remain high across positions and may impact player performance. Our hypothesis was, there would be an increase in concussion incidence following implementation of the 7 day DL, but this would not have a negative impact on player’s postconcussion performance. Study design: This is a descriptive epidemiology study. Methods: The concussed players from 2005 to 2016 were identified from the MLB DL and verified using established new sources. Position-specific performance metrics from before and after injuries were gathered and compared to assess effects of the injury. Postconcussion performance metrics were compared before and after the 7-day DL rule implementation. Results: A total of 112 concussed players were placed on the DL. For all position players, the batting average (BA) and on-base percentage (OBP) showed a nonsignificant decline after injury (P=0.756). Although performance statistics for pitchers declined on average, the trend was not statistically significant. Postinjury BA and OBP did not significantly change before (0.355) and after (0.313) the 7-day DL rule change in 2011 (P=0.162). Conclusion: The incidence of reported concussion has increased with the 7-day DL rule change. Concussion incidence was highest in catchers and pitchers compared with all other players. The most common causes identified as being hit by pitch or struck by a foul ball or foul tip. While new league rules prevent collisions with catchers at home plate, injury by a foul tip was the most common cause for concussion. The shortened time spent on the DL did not negatively impact player’s performance. Further research on protective helmets for catchers may reduce concussion incidence. An epidemiological study using data from 2002 and 2008 by Posner et al2 showed that head injuries account for ~1.3% of all MLB injuries per season and that fielders have more head injuries than pitchers. In addition, a more recent study by Green et al5 showed that mild traumatic brain injury is an important problem in professional baseball players, especially for catchers. Thus, it is clear that acknowledging and mitigating these types of injuries are critical to maintaining MLB players’ future health and safety. As the game of baseball changes and new risks arise, so does the variety of safety considerations and precautions taken by MLB administration. In 2005, batting helmets with molded crowns were introduced as they produced a tighter fit on a player’s head, but the effectiveness of these helmets in preventing or reducing the risk of head injuries has not been shown in any MLB-specific study. Even so, the overwhelming majority of players opted to use these helmets.6 In 2009, the issue of concussions in MLB was identified as a recurring problem and, in response, Rawlings unveiled yet a new batting helmet (S100) (Table 1).7 These new helmets were thicker and stronger and able to protect players from injury from baseballs traveling at speeds up to 100 mph, compared with the previous helmets, which only provided protection from balls traveling up to 70 mph.8 Even so, it was not until 2013 that the MLB made helmets mandatory.9 Although head injuries are predominately seen in batters, catchers are also at risk and, therefore, changing helmets is not the only available preventative measure.10 Catcher’s risk of injury is not only due to errant balls but also through bodily contact with other players, which led to the MLB rules’ committee recently passed new regulations banning home-plate collisions between catchers and runners.11 In 2014, the rules’ committee also implemented additional safety measures for pitchers, approving a padded cap to give them more protection against line drives.12 However, these protective measures have largely been implemented based on anecdotal evidence, due to the limited published literature on rates of head and face injuries in MLB players. Abbreviation: MLB, Major League Baseball. Performance metrics data were collected for injured players using a well-cited baseball statistics repository.9,21 Metrics used to measure athlete performance differed for pitchers and catchers/field players. For pitchers, collected metrics were earned run average (ERA) and walks and hits per innings pitched (WHIP). For catchers and field players, we collected at BA, hits per at bats, OBP, and hits and walks per at bat. Performance metrics by season and career averages were recorded. Pre- and postinjury metrics were based on the season when an injury occurred. The all-star break in mid-July was used to classify injuries as happening early (pre-break) or late (post-break) in the season. If an injury occurred before the break, then preinjury performance metrics were those from the previous season. If an injury occurred after the break, then both pre- and postinjury performance metrics from the same season were used.If a player missed more than half of the season (>81 games) due to injury, then performance metrics for pre- and post injury from the previous and subsequent seasons were used. Using MLB data, the total number of injuries for pitchers, catchers and field players who were placed on the DL was determined. This information was used to estimate the proportion of head and face injuries in these players. To calculate the relative risk of concussion at the different positions, it was assumed that there were four catchers, eight infielders, eight outfielders, and 20 pitchers on each of the 30 team’s rosters. Independent sample t-tests were performed to compare averages between groups. Paired sample t-tests were performed to compare pre- and postinjury statistics. The potential effect of a shorter DL time on player performance was analyzed by comparing postinjury performance before and after the implementation of the 7-day DL rule. All statistics were performed using the SPSS software (IBM Corporation, Armonk, NY, USA) with a significance level of 0.05. One hundred twelve players placed on the DL with a concussion were identified over the 11-year period. Of these players, there were 39 (34.8%) outfielders, 37 (33%) catchers, 23 (20.5%) infielders, 10 (8.9%) pitchers, and 3 (2.7%) batters. The incidence rate of concussions increased significantly among players in all positions after the implementation of the 7-day DL rule in 2011 (P=0.003). Based on the estimated number of players at each position in the league, fielders demonstrated the greatest incidence rate of concussion with 9 per 100,000 athlete exposures. The incidence rate in catchers was 3 per 100,000 athlete exposures. The most common causes of concussion were being struck with a foul tip or foul ball (25%), collisions with the field wall or other players (23.2%) and hit by a pitch (25.9%) (Figure 1). The number of concussed players on the DL increased every year throughout our sample with a low of 4 in 2005 to a high of 21 in 2013 with rates being the highest for the following years after the 7-day DL rule change in 2011 (Figure 2). Two players were excluded from further analysis, as one player was not able to return to play following concussion and another player missed additional time due to migraine symptoms. 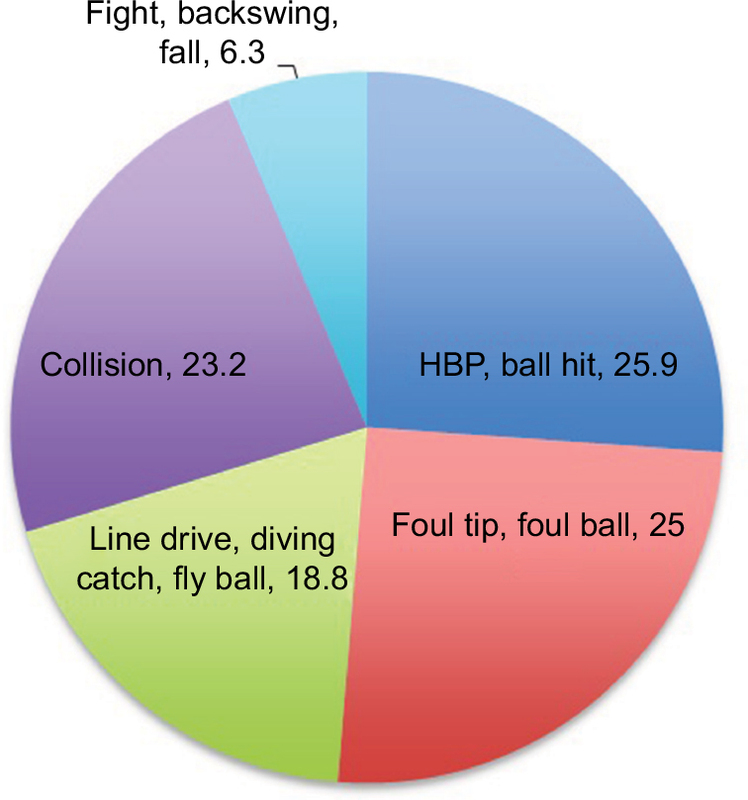 Figure 1 Most common causes of concussions in MLB players at all positions from 2010 to 2013. Note: HBP indicates players who were hit by pitch. Figure 2 Annual incidence of concussion in all position MLB players. Abbreviations: DL, disabled list; MLB, Major League Baseball. Players missed an average of 31.3 days following concussions (range 6–183 days). The number of concussions appeared to increase after the 7-day DL rule implementation in 2011. When stratifying players based on the cause of concussion, players who were injured in a collision or fall missed an average of 28.94 days, whereas players who were injured by the ball missed 42.26 days; however, this difference was not statistically significant (P=0.240). When comparing performance metrics for pitchers, the average preinjury ERA was 3.64 and the preinjury WHIP was 1.33. These averages increased postinjury to an average ERA of 3.78 and an average WHIP of 1.51; however, these increases were not statistically significant (P=0.800 and 0.338) (Table 2). When comparing performance metrics for all other players, the average of BA and OBP was 0.256 and 0.322 preinjury (Table 3). Decline in performance metrics postinjury was nonsignificant in BA (0.25, P=0.580) and OBP (0.32, P=0.756) (Table 4). Abbreviations: ERA, earned run average; WHIP, walks and hits per inning pitched. Abbreviations: DL, disabled list; ERA, earned run average; WHIP, walks and hits per inning pitched. For all position players, performance statistics did not show a significant decline on neither BA (P=0.564) nor OBP (P= 0.162) after the 7-day DL rule implementation when compared with before 2011. Pitchers showed a nonsignificant decrease in both ERA (P=0.079) and WHIP (P=0.241) (Figures 3 and 4). 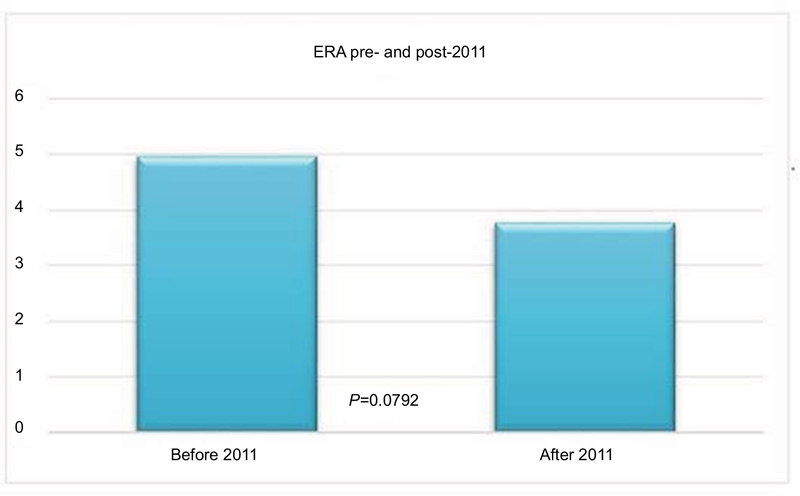 Figure 3 Postinjury ERA compared pre- and post-2011. Abbreviation: ERA, earned run average. 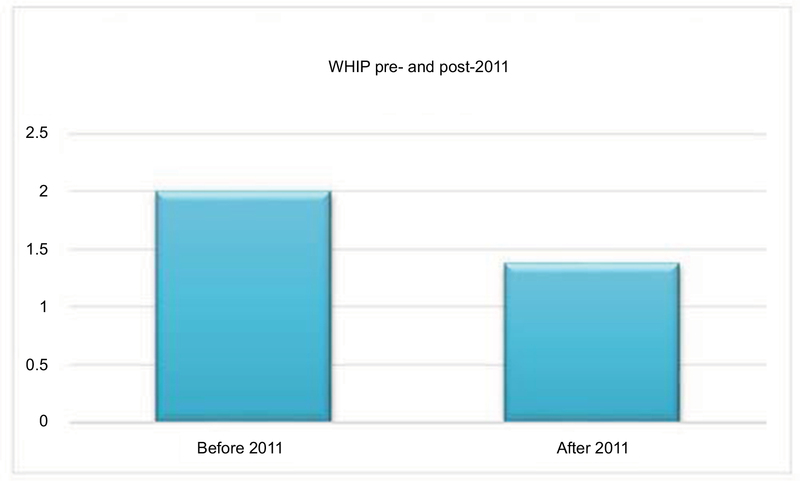 Figure 4 Postinjury WHIP compared pre- and post-2011. Abbreviation: WHIP, walks and hits per inning pitched. According to the MLB policy, return to play for a player after concussion requires that all symptoms have resolved even with exertion and the team’s assigned physician determines whether it is safe to reengage in sports. Interestingly, even with the shortened DL rule, players still missed almost a month (31 days) on average due to concussion. In comparison, professional hockey players miss only 8.3 games based on previously reported data,25 which typically amounts to a span of 18 days based on the NHL scheduling. It is unclear why postconcussion time loss is higher in MLB players, but our findings are consistent with previous reports, where MLB players missed an average of 32.12 days following concussion.16 Further evaluation should focus on why MLB players are out for extended periods of time after a concussion injury. Similarly, previous studies of NFL, NHL, and NBA players failed to show a decline in performance after concussion.16,25–27 The MLB has a better tracking of player statistics compared with other sports where performance can be more difficult to objectively evaluate. On a similar matter, the decrease in DL time proves more cost-effective for teams since they pay the replacement player less days. Further studies should look at the cost analysis of the 7-day DL concussion rule and the financial effects it entails. Our study also focused on injury rates based on player positions. We found an increased rate of concussions in infielders and outfielders combined, which is probably due to the increased risk of encountering a collision or being struck by a ball. The second highest rate of concussion by position was found in catchers. This finding indicates that the current helmets available for catchers do not provide adequate protection for these players. Future studies need to evaluate the impact on concussion rates in catchers after the recent ban on collisions at home plate. This study has several limitations based on the available data. Data were collected from publicly available databases and not directly from players’ medical records, which could have resulted in reporting bias. Furthermore, by simply assessing player statistics following concussion, we did not evaluate the neurocognitive function of players after injury and this may be oversimplifying a complex problem. Concussion injuries are of concern to all athletes.28 The results reported in this study provide valuable information for athletes and team physicians alike regarding concussion rates in MLB players. The advent of the 7-day DL rule has led to an increased rate of reporting concussions. This increased reporting provides more data to assess an athlete’s postconcussive performance. However, since postinjury statistics is very similar to pre- and postinitiation of the 7-day DL rule, it can be argued that the 7-day DL rule has provided a safe and efficient way for players to recover from concussion injuries. In addition, our findings provide significant data for further amendments in MLB policies and advancements in the protective equipment used by the MLB players. Using other sports as examples, it is clear that concussion injuries can result in long-term sequelae; thus, recognition and measures to maintain player safety must take precedence in the realm of concussion management. This article has not been previously submitted for publication or published. This work has not received any outside funding or grants. Sawchik, T. (2014). MLB pitchers setting velocity records, altering balance of power. Trib Live, 5423918–74. Posner M, Cameron KL, Wolf JM, Belmont PJ Jr, Owens BD. Epidemiology of major league baseball injuries. Am J Sports Med. 2011;39(8):1676–1680. Rosenthal K [webpage on the Internet]. MLB Studying Headgear for Pitchers. 2014. Available from: http://www.foxsports.com/mlb/story/line-drive-comebackers-head-trauma-studying-protective-headgear-for-pitchers-brandon-mccarthy-juan-nicasio-091712. Accessed June 21, 2014. Jones ISM. In: Administration NHTS, editor. Head Impact Tolerance: Correlation Between Dummy Impacts and Actual Head Injuries. Arlington, VA: Insurance Institute for Highway Safety; 1984. Green GA, Pollack KM, D’Angelo J, et al. Mild traumatic brain injury in major and Minor League Baseball players. Am J Sports Med. 2015;43(5):1118–1126. Lukas P [webpage on the Internet]. MLB Midseason Fashion Report. 2005. Available from: http://sports.espn.go.com/espn/page2/story?page=lukas/050714&num=0. Accessed June 21, 2014. Lukas P [webpage on the Internet]. Better to Look Good Than Feel Good? 2009. Available from: http://sports.espn.go.com/espn/page2/story?page=lukas/090831&sportCat=mlb. Accessed June 21, 2014. Waldstein, D. (2009, August 12). Safer batting helmet draws resistance from some players. New York Times [New York], p. B11. CISION Prnewswire [webpage on the Internet]. MLB Players to Debut New Rawlings S100 Pro Comp™ Batting Helmet This Season. 2012. Available from: http://www.prnewswire.com/news-releases/mlb-players-to-debut-new-rawlings-s100-pro-comp-batting-helmet-this-season-146991495.html. Accessed June 21, 2014. Athiviraham A, Bartsch A, Mageswaran P, et al. Analysis of baseball-to-helmet impacts in Major League Baseball. Am J Sports Med. 2012;40(12):2808–2814. Hagen P [webpage on the Internet]. MLB Votes to Eliminate Homeplate Collisions. 2013. Available from: http://mlb.mlb.com/news/article/mlb/mlb-rules-committee-votes-to-end-home-plate-collisions?ymd=20131211&content_id=64598138. Accessed July 30, 2014. Hagen P [webpage on the Internet]. MLB Approves New Padded Cap for Pitchers. 2014. Available from: http://mlb.mlb.com/news/article/mlb/major-league-baseball-approves-padded-cap-for-pitchers?ymd=20140128&content_id=67202016. Accessed June 21, 2014. Mihoces G [webpage on the Internet]. NFL Concussion Settlement Gets Preliminary Approval. 2014. Available from: http://www.usatoday.com/story/sports/nfl/2014/07/07/nfl-concussion-lawsuit/12312179/. Accessed August 7, 2014. [webpage on the Internet]. NCAA Reaches Proposed Settlement in Concussion Lawsuit. 2014. Available from: http://www.ncaa.com/news/ncaa/article/2014-07-29/ncaa-reaches-proposed-settlement-concussion-lawsuit. Accessed August 7, 2014. Wasserman EB, Abar B, Shah MN, Wasserman D, Bazarian JJ. Concussions are associated with decreased batting performance among Major League Baseball players. Am J Sports Med. 2015;43(5):1127–1133. Schwindel LE, Moretti VM, Watson JN, Hutchinson MR. Epidemiology and outcomes of concussions in Major League Baseball. Ann Orthop Rheumatol. 2014;2(3):1022–1027. Major League Baseball Disabled List Data. 2014. Available from: https://www.fangraphs.com/tht/2014-disabled-list-information-and-so-much-more/. Accessed September 13, 2019. MLB.com. Fantasy baseball injuries updtates. Available from:http://mlb.mlb.com/mlb/fantasy/injuries/. Accessed September 13, 2019. TSN: MLB. 2014. Available from: https://www.tsn.ca/mlb/players. Accessed September 13, 2019. Erickson BJ, Gupta AK, Harris JD, et al. Rate of return to pitching and performance after Tommy John surgery in Major League Baseball pitchers. Am J Sports Med. 2014;42(3):536–543. Baseball-reference.com [webpage on the Internet]. Available from: http://www.baseball-reference.com/. Accessed July 12, 2014. Mihalik JP, Stump JE, Collins MW, Lovell MR, Field M, Maroon JC. Posttraumatic migraine characteristics in athletes following sports-related concussion. J Neurosurg. 2005;102(5):850–855. Schwartz A. 7-Day D.L. Estbalished to Aid in Recovery from Concussions. New York: New York Times; 2011. McCrory P, Meeuwisse W, Aubry M, et al. Consensus statement on Concussion in Sport – the 4th International Conference on Concussion in Sport held in Zurich, November 2012. J Sci Med Sport. 2013;16(3):178–189. Wennberg RA, Tator CH. Concussion incidence and time lost from play in the NHL during the past ten years. Can J Neurol Sci. 2008;35(5):647–651. Yengo-Kahn AM, Zuckerman SL, Stotts J, et al. Performance following a first professional concussion among National Basketball Association players. Phys Sportsmed. 2016;44(3):297–303. Kumar NS, Chin M, O’Neill C, Jakoi AM, Tabb L, Wolf M. On-field performance of national football league players after return from concussion. Am J Sports Med. 2014;42(9):2050–2055. Zuckerman SL, Yengo-Kahn AM, Kerr ZY. Chapter 15. Athletic performance after sport-related concussion. In: Hall EE, Ketcham CJ, editors. Concussions in Athletics: Assessment, Management and Emerging Issues. Elon, NC: Nova Science Publishers, Incorporated; 2017:211–222.